17 June 2018, Annapolis, MD — Sail1Design has been lucky to be part of some great moments over the years, mostly when we do our job, and take part in recognizing youth, high school, college, and one-design sailors. Reading nomination letters, hearing from our community about unsung heroes, sharing in the joy of the winners…… makes the whole Sail1Design project, now 11+ years in the making, more than worth it. Remember, we only choose candidates from nomination letters sent in, so we sit back, and take what we get. This year, we were faced again with narrowing an incredibly deserving field. Not easy. In fact, we almost couldn’t finish the job. Two candidates stood out, for different but equally compelling reasons. After going back and forth, and at first considering having two winners, we settled on one. This year, the S1D/Gill Coach of the Year Award goes to Scott Iklé. Scott is the Head Intercollegiate Coach at Hobart/William Smith, a position he’s held for 25 years. His roots there go even deeper, however, as Scott is a 1984 graduate of the college himself. Scott is a full-time, lifetime professional contributor to the world of competitive sailing, and is a standout sailor himself. He’s been worthy of an award like this for a long time, so we are elated that he was nominated. Scott has been incredibly successful over the years at Hobart/WS, and while this year the team didn’t win any of the big ones, we fell in love with his nomination letter, which came from one of his players. I think the part that touched us the most was the fact that he was nominated by one of his players, along with her “meet us halfway” description (see letter below) to show us his dedication to their team. Scott’s collegiate team’s results this year were pretty incredible as well, across the board. While most college teams would kill to be in the top 3 of any of the National Championship events, Hobart was there in all of them: 4th at COED Nationals (3 points out of 2nd), 3rd (tied for 2nd in record) at Team Race Nationals, and 3rd at Women’s Nationals. That’s pretty impressive stuff for one team, and this across-the-board average finish place at the three National Championship events was bested only by College of Charleston. Congratulations Scott, and well-earned. Thanks to our sponsor, Gill NA, our winner will receive an embroidered, beautiful Gill Race Series Softshell Jacket. Below is some copy taken from the nomination letter Scott received. What a tribute. Coming into college, I wasn’t sure I was going to have the skill or courage to make it past even the first day of try-outs for the Hobart and William Smith Sailing Team. But here I am today, newly graduated from HWS after spending all 4 years with the sailing team I’ve called home grateful for every second I spent here. To us, Scott really knows how to connect to everyone on the team. Scott knows what every person needs to push them to the next level. Scott also is not a coach who will pump your ego, but he will ensure you that you are able and have the potential to make things happen… Scott is willing to go that extra mile for his team, to meet them halfway. This year at Old Dominion University, Scott quite literally met us halfway, wading waist deep in the water to be eye level and connected for our “between set pep talk” (that’s a huge feat, for those of us who know that Scott wears two pairs of spraypants at practice). He knows when to push, and when to let go and let us shake off the bad race, helping us get ready for the next one. ….Scott has this unique ability to understand what his sailors need, whether it be in his office on campus, hanging onto his rib after a drill at practice, or standing onshore in between sets at a regatta. 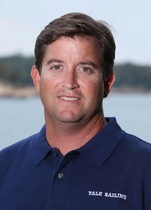 In my four years at HWS, Scott has taken a team of the most unlikely people, who in 2015, did not qualify for any ICSA Finals in Newport RI, to being a strong cohesive team that placed 3rd in Women’s Finals, 3rd in Team Race Finals, and 4th in Coed Fleet Race Finals. To all of us, Scott has proven to be so much more than just a coach, but a mentor, someone we can learn from while cracking some jokes along the way, but most importantly, someone we can confide in. 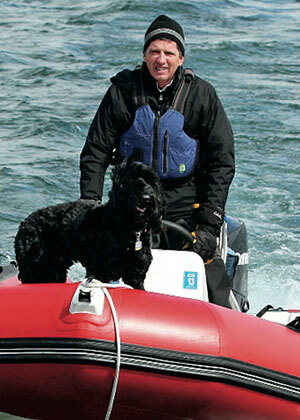 Scott has made Bozzuto Boathouse and the HWS Sailing Team an eternal home for his team. And although Scott would probably deny this (being as humble as he is) I truly believe there is no person more deserving of this award than Scott Ikle. 2017 S1D/Gill Coach of the Year Announced!! Sail1Design has been lucky to be part of some really great moments over the years, mostly when we take part in recognizing youth, high school, college, and one-design sailors. Reading nomination letters, hearing from our community about unsung heroes, sharing in the joy of the winners…… makes the whole Sail1Design project, now more than ten years in the making, more than worth it. As great as the ride has been, this year’s Gill Coach of the Year process, I must say, topped it all. Among so many more-than-worthy nominations, one stood out a little, then a little more, then a lot. Our winner this year received nine nomination letters, many of them well more than a page long, detailing eloquently, genuinely, and most thoughtfully, the the work and passion of Coach Bill Healy of Yale University. Perfect timing as well, as Bill has just recently helped Yale win the 2017 ICSA Championship, finish 2nd in Team Racing Nationals, and 2nd in the COED Dinghy Nationals! Thanks to our sponsor, Gill NA, Bill will receive an embroidered, beautiful Gill Race Series Softshell Jacket. What’s more, Bill will know forever that this team appreciates him beyond compare, and he will remember forever the words they wrote about him. What a tribute. After reading all the nomination letters carefully, it became very clear that this year, Bill Healy is the S1D/Gill Coach of the Year; he fits the description to perfection. Bill, congratulations; Yale is lucky to have you, and I should add, you are lucky to have this team. Below are just some excerpts from the incredible nominations Bill received. “The results speak for themselves. 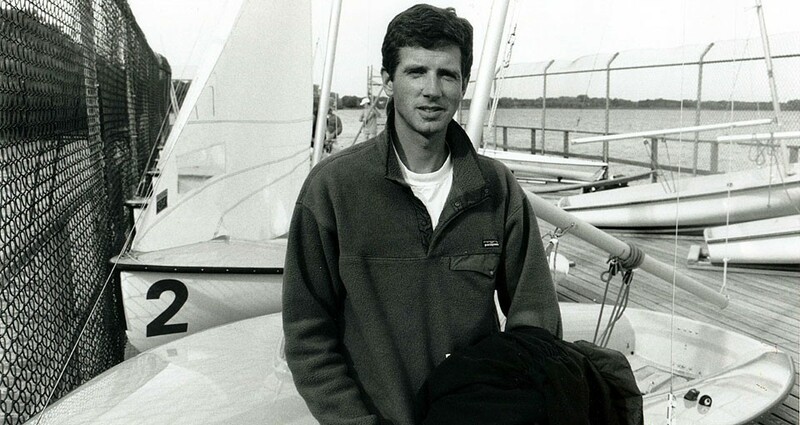 Since Bill joined the team, the Varsity Yale Sailing program has won 14 National Championships, 4 Fowle Trophies, and 4 College Sailor of the Year awards. Of those, Bill was the primary coach at 8 of the 14 National Titles. I would like to nominate Bill Healy for coach of the year. Bill Healy is easily one of the best coaches in all of college sailing. As compared to a lot of other coaches, Bill stands out to me because he doesn’t stand out. He is one of the most low-key and humble people I know. Hardworking and empathetic, he is always working for the good of Yale Sailing, whether that is doing boat repairs or just improving the emotional atmosphere, he does it all behind the scenes. Bill never looks for recognition for all that he does, he just works hard because he cares so much for the team. Just because he doesn’t look for recognition doesn’t mean he isn’t deserving of it. Throughout my freshman year I have been lucky enough to get to spend a lot of time with Bill at various regattas throughout the country. In comparison to many other coaching styles I have experienced in the past, Bill’s is unique in that less is more. He’s not one to yell or drone on about a mistake made, but rather he is straightforward and to the point, and says only what he needs to. I think this has been extremely impactful for me personally because rather than getting my nerves up, his calmness is contagious, and will often help me focus on what’s really important. Even on the national scale when nerves can really be on edge, Bill is always there to keep everyone cool and collected. While Bill is undoubtedly an incredible coach on the water, the real reason I write to nominate Bill is his presence off the water. Bill truly is the heart and soul of the Yale Sailing team. In the sport of sailing, so many different personalities come together to form a team and Bill excels at being able to balance those personalities and to maintain a steady emotional atmosphere for the team. Simply stated, Bill keeps us all smiling at practice and regattas. He knows when to allow us breaks and when to push hard. Bill has mastered the vital balance between striving for excellence and leaving room for goofy fun. Some of my fondest memories include Bill bringing us Easter baskets during a cold and windy Easter Dellenbaugh and Bill handing us a waterproof camera and giving us free reign to document the Duplin from the water. Bill is the kind of coach who can push a team of all underclassmen to top five finishes at major regattas, but also remembers to buy a personalized cake for a teammate’s birthday that weekend. Additionally, I have seen Bill and his whole family drive 45 minutes just to see a student play featuring several members of our team. Leading by example, Bill’s actions and simple acts of kindness speak volumes about his love for our team and his desire to keep sailing fun for each one of us. Finally, no description of Bill would be complete without mention of his work ethic. For a decade and a half, the logistics of running a top college sailing team have fallen onto Bill’s shoulders. Each week he plans weekend housing and transportation; he handles money and food, all while helping to maintain the beautiful facility that we call home. He does this all on top of his traditional coaching duties of running practices, travelling to regattas, and leading debriefs. Seeming to keep all the balls in the air effortlessly, Bill juggles the immense load without complaint. All the while, he never asks for any sort of recognition for his efforts, preferring to quietly work to get the job done. Still, it is obvious to anyone who spends time with him that Bill truly goes above and beyond the call of duty in order to keep our team running smoothly. Bill’s official title is “Assistant Coach,” but never has a title been so insufficient to describe the work of one man. Bill works tirelessly behind the scenes on our team to ensure that everyone remains happy, healthy, and competing to their full potential. He is humble and reliable, funny and knowledgeable, and truly one of the kindest people I have met. In my role as captain, I find myself striving to continue to maintain the balance that Bill brings to our team. He is an incredible role model and I am beyond honored to call him my coach. I think you would be hard pressed to find anyone more deserving to be named Coach of the Year. Thank you very much for taking the time to consider my nomination. I have had the privilege of having Bill as a coach for the past three years, and after practicing under him each week, running races as the RC boat with him at various regattas, and traveling with him and the team, I can testify that he is both a good and a great coach (to use the terms of the introductory article describing an outstanding coach), deserving of this award. Bill has the core qualities that all “good” coaches possess, those traits that don’t require technical knowledge of a sport but are essential to good coaching; his dedication, organization, and patience ensure that three or four different teams arrive at three or four locations all over New England each weekend, ready to compete at the best of their abilities. Even more importantly, continuing with the terminology of the article, Bill is a “great” coach. Beyond possessing the core qualities described above, he is a master of his sport. Sailing is incredibly complex; to paraphrase Dave Perry, imagine playing a football game on a field that is constantly churning, with no defined boundaries or referees. In such an complex activity, the coaching becomes all the more important, and Bill is an exemplar of what it means to be a sailing coach. His measured words reveal a careful, deliberate approach to sharing his knowledge, and they display his deep mastery of the subtleties of making a sailboat move faster and smarter across a racecourse. By virtue of his careful consideration before speaking, Bill’s words carry great weight. …..However, what distinguishes Bill Healy as a coach is his ability to directly connect with each and every individual he mentors. Unlike a rote lecture on team race plays or the re-stated tuning numbers written in one’s Wet Notes, Bill tailors every piece of advice to the individual – from his tone to the timing. He is able to assess what each sailor needs to improve in that moment and provides the necessary environment for them to learn that skill. Bill recognizes that there’s not just one way to win a regatta, that each individual comes at a scenario with a vastly different set of skills and stresses. Where for one team member he’ll stay late after practice to provide feedback on 100 additional tacks on the whistle, for another sailor he’ll simply point out the osprey in the nearby tree to keep them positive after a particularly unforgiving set. Bill’s personalized coaching strategy is what truly allows every individual on the Yale sailing team to improve at such a fast pace. On a personal note, I struggled with the transition from high school to college, finding myself across the country from my family and with feelings of inadequacy due to so many formidable sailors filling the other 420s at practice. Bill’s positivity and unwavering support gave me the assurance I needed to feel welcome and find my own spot on the starting line. Yes, he is the coach to sail over to when I just can’t point like the leeward boat because he will always have the solution. But Bill is also there on the days when I’ve been so stuck in a lull that its effects seem to linger even after the racing is over, because his positive attitude, kindness, and support will be exactly what is needed. For these reasons, I wholeheartedly believe Bill Healy should be Sail1Design’s next coach of the year. I’ll be honest, during my four years on the Yale University sailing team, I put in quite a bit of time on the coach boat. Although this might not be where most sailors would decide to spend practice, in many ways, I saw it as a blessing. It meant I got to be with Bill. I was never going to be a part of the starting squad. So while Bill certainly helped improve my roll-tacking technique and provided advice on downwind dynamics, he taught me something more important. He taught me how to be a teammate. From him, I learned that my contribution to the group could come from something other than my sailing ability. Being a support system could be as meaningful as being the one on the starting line. So I became a steady cheerleader. I knew what snacks others liked and could drive to events without getting lost or getting caught for speeding. Bill never explicitly talked about being a source of encouragement. He just led by example. I never doubted that Bill was in my corner – that he would help me in whatever way he could. Whereas many coaches might not have paid me much attention because I was never going to get a bullet, Bill never made me think I was wasting his time. He showed me how I could be a part of the team, and made me feel like I belonged. I couldn’t ask for anything further out of a coach, and he is more than deserving of this award. In my mind, there is no coach who exemplifies all of the characteristics of this honor more than Bill. I had the privilege of sailing at Yale for four years and can say that my experience was a spectacular one thanks to Bill Healy. Bill dedicates every part of his life to supporting his team. To Bill, we are not just sailors and students who come to practice, but we are like his family and kids. He cares about our success as sailors, students, and people, and he supports us on and off the water. Before my time at Yale, I had never stepped foot in a 420, and as a member of the co-ed team at Yale, I should have had less interactions with Bill since he mainly traveled to regattas with the women’s team. Instead, I found that Bill invested his time and energy to make sure I was picking up the tricks of the trade and learning what makes a great crew. He would coach me and my teammates on the water, take countless videos of us during practice, and speak to us during debriefs or even on days where we didn’t have practice so that he could help us learn how to be better sailors and teammates to one another. I joined Yale as an amateur sailor, but I left feeling confident and successful in a very challenging sport because of the coaching and lessons that Bill taught me. Outside of actually coaching us, Bill spent every ounce of his energy (and more!) to make sure that every element of our sailing program ran smoothly so that we could have incredible experiences. Bill handles every element of logistics from travels, team money, finding us extra gear, and repairing boats, to planning entire regattas at Yale and zooming in on his motor boat to grab us an extra screw when our boom fell off mid-race. If anyone was ever tired of stressed, Bill was there to talk us through it. If anyone was every worried about sailing performance, he’d work with us to make sure we improved and to remind us that we are an integral part of the team no matter our position. Bill has been the greatest coach, leader, and friend I could have asked for during my time at Yale. He is passionate, dedicated, and motivates us all. MOST IMPORTANTLY, Bill is humble. Not once has Bill ever sought recognition for his hard work year after year. More often than not, his hard work and dedication to his sailors and the team go unnoticed. It’s easy for our team and those around us to forget just how much Bill does for us every day. Bill is our fearless and quiet leader, and now is the chance to recognize him for everything he has done for me as a sailor, for my teammates, and for Yale Sailing over the years. I hope that you will recognize Bill with the honor of being S1D Coach of the Year. He is truly deserving. My freshman year, I sailed almost exclusively on the women’s team and had the pleasure of having Bill coach me nearly every weekend. Never have I had a more attentive or caring coach. It’s not easy to travel with half a dozen or more girls every weekend, but Bill always handled the job seamlessly. With a particularly emotional group of girls last year, Bill always helped to ease stress on and off of the water and worked to make everyone as happy as possible. During the Duplin Women’s Team Race this year, when temperatures were below freezing, the girls all came off of the water and received a text from Bill asking for our Dunkin Donuts orders. He came back with warm drinks to warm us up before heading back out into the sleet. Bill always meets the team at the dock during regattas, regardless of how cold it is. At the Dellenbaugh this year when the temperature and wind were incredibly cold, Bill was the one standing at the end of the dock, recording the races and cheering up the girls when they came in. Daily, at practice, Bill is the last person to leave YCYC. He lives about 45 minutes away, by far the farthest person from YCYC, yet he’s the one who makes sure that everything is put away properly and locked up before he drives back to his family. Bill plans nearly all of the logistics of the team—from hotel to travels to boat repairs to balancing the financial side of YCYC. It is clear from everything that Bill does that he really pours his heart into his work and this benefits the undergrads immensely. Because he is someone that never asks for recognition and often does behind-the-scenes work, he’s often overlooked. I think awarding Bill the Sail1Design Coach of the Year is a step towards giving him the attention he deserves for all of the hard work he’s put into his job for years. This is a letter of support for my coach, William (Bill) Healy. Bill may not be the loudest coach, but he is certainly the reason for our success, he is the glue that holds our team together. Without Bill, we would be lost and we certainly would not have the record for the past four years that we have. I am a senior on the Yale Sailing Team, and have had the pleasure of being coached and mentored by Bill for my entire time at Yale. I have watched in awe as Bill provides several comments during each debrief that change the way I think about different aspects of sailing—turning what some coaches may need an hour to communicate into a five minute explanation that immediately leads to better results. I have shivered and cried to Bill as he has made a fire at Dartmouth and calmly helped us get more clothing and ready to compete again. I have talked to Bill about what to do for classes in school and about what life after graduation will be like. I have even performed in a play that Bill and his daughters came to support me in! Bill has been an incredible coach but also an amazing mentor, has provided an incredible support system, and has been a really good friend. I will always be indebted to Bill. Additionally, Bill has always made me feel accepted and welcomed onto the team. This has been incredibly important to me because when I joined the team freshman year, I really did not know how to sail. Bill always had faith in me, he always helped me, and he always made me feel that I was wanted, that I was needed, and that I was appreciated on the team. And he helped me get to the place I am now (I started team racing nationals my sophomore year). I cannot express enough how important an influence Bill has had on my life and how important he is for the success and wellbeing of the Yale Sailing Team. It is for this reason that I would like to strongly submit my support for Bill Healy as coach of the year. Thank you for your consideration. Sail1Design annually seeks your nominations for the S1D Coach of the Year, for a coach that embodies the qualities (and more) listed in the article below. Sailors, this is your award! The Sail1Design staff chooses the winner only from our readers nominations! This is a great opportunity to recognize a coach that you feel makes a difference! Gill generously supplies the winning coach with a clothing award! All good coaches, regardless of their chosen sport, share some important fundamental qualities that transcend technical knowledge, or specific x’s & o’s. In other words, whether it’s a basketball, tennis, hockey, football, chess, or sailing coach, there are certain key characteristics to good coaching, and none of these really requires technical knowledge of the sport they are in. Here are some of those characteristics: logistics, organization, energy, leadership, passion, creativity, patience, dedication, motivational skill, humility. I would bet that you could take a good coach, put him or her in a new sport, and that coach would find some success. Think about the best coach you ever had, and visualize that person in another sport, and you might see just how that person could adapt and still be a difference-maker. However, we all know that great coaches not only possess these core qualities, but indeed they are also masters of the subtleties, rules, and technical chess moves of the sport they are involved in. Very often, great coaches are former players themselves, and often they are good, but not necessarily great players. In any event, it seems virtually certain that actually having been in the arena at some level, having been a true game player, is a necessary ingredient for a great coach. So then, what an important advantage sailing coaches have, since the sport allows lifelong top-level competitive opportunities. While it would be impossible for a middle-aged football coach to live, first-hand, what his players go through on the gridiron, middle-aged sailors and coaches can stay current, and can compete right alongside the world’s best sailors, and even win world championships in sailing. Opportunities exist in team racing, match racing, and all types of one-design classes offer regattas, year-round. In this manner, sailing coaches have the ability to get inside the sport, at the highest levels, learn more, and feel the same things that their players go through out on the race course. The empathy gained here is a very powerful tool that great coaches employ when coaching. Getting into the rhythm of a sailboat race, realizing first-hand the excitement and frustrations of the sport, preparing mentally for each race, “knowing when to tack”, these are all things that coaches must be able to talk to their players about, and talking to them about these things is so much more clear and present when done by someone who is actually good at them, and has done them recently at a high level. For example, it was always easy for me to say to a team, “make sure when you are in FJ’s at the starting line to allow yourself more leeward room to accelerate since the foils are small and the boats need to go bow down first before they start lifting.” It was really easy to say. It was quite another thing to actually do it, and to go out on the starting line, in FJ’s, and practice what I preached. That was a LOT harder, and I drew a great deal of empathy with my players from that situation and recognized better ways to talk about it and to talk them through it, having been there myself. This is especially true in team racing, where coaches can see plays easily on the coach boat or on the drawing board, but it’s one thing to talk about a mark trap at Mark 1; it’s another thing altogether to go out and be able to execute it. Without being, or having been, in the arena, sailing advice and technical coaching can be somewhat hollow compared to other sailing coaches who know it first-hand and live what they coach. So, when you look to your coaches for advice or to get to that next level, or if you are a interested in sailing in a college program, take a moment and check out the coaches resumes, just as they will most assuredly be checking yours. The list that makes coaches good coaches should be there for sure, but see if the coaches list how, or if, they stay current in their profession and have the passion to go out on the racecourse themselves. Great coaches usually always have a story, and very recent one, of a lesson learned at a regatta they sailed in themselves. They love to sail and get better, if only to become a better sailor and coach. While there is a short list of coaches who choose to (and can) do it all, many top collegiate programs now share these coaching qualities by hiring an assistant or co-head coach, who is very often a recent college sailing alumnus and is active in dinghy racing and brings that empathy, right away, to the team. The head coach then ties everything together with experience, maturity, management, and knowledge of the game. If you’ve ever noticed, baseball coaches actually suit up for games even though they certainly won’t be playing. This historically comes from the old “player-coach” model, and perhaps, this connects them with the game and the player more intimately. Sailing offers the unique ability for all ages to compete at the highest levels of the sport, and great sailing coaches take advantage of this, “suiting up” themselves and making themselves better at coaching by sailing competitively. webmaster@sail1design.com and explain in 300 words or less why your nomination deserves to be the S1D Coach of the Year.